When I was little, very little, my mother was called by a neighbor saying they were taking their son to be on the Uncle Gus show in town and wouldn’t it be nice if we could go along. 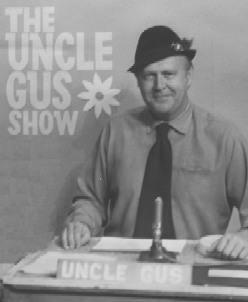 Uncle Gus was a popular children’s show and was live. At the risk of dating myself, they did not tape TV back then. So dressed in a cute little dress, tights and uncomfortable buckle shoes, we were brought down to the studio on Elm St. in Manchester. I was really too young to be on a children’s television show, but my mother loved to shove me into uncomfortable situations of which I was ill prepared and this was just the first of many. Her advice to me before we were whisked off to sit in the audience was to do whatever Danny did. And so, when “Uncle Gus” asked who wanted to come up and sing a song, Danny raised his hand…and so did I.
I must have been awfully cute back then because of all the kids sitting on those hard little benches raising their hands as if they were trying to touch the ceiling and chanting, “oooh, oooh, me, me,” Uncle Gus picked me. To be honest, I didn’t even know why I was raising my hand, and didn’t really care, until a stage hand came and walked me over to the desk where Uncle Gus sat and plopped me in the chair next to him. (Think Johnny Carson) He then moved his desk top microphone over to me and asked me which song I wanted to sing. I’ll give Mr. Gus credit for being patient. He tried to coax me into singing Twinkle, Twinkle Little Star or Mary Had a Little Lamb, but I wasn’t having any of it. I was supposed to do what Danny did and Danny was sitting on the bleachers with his arms crossed giving me that “wait till I get you in the backyard alone” stare. Finally, Uncle Gus gave up and the stage hand walked me back to my seat. I don’t think Danny spoke to me the whole way home. My mother, on the other hand, had a great laugh over the whole thing. There was her extremely shy daughter, on live TV none-the-less, being asked to sing a song and all I would do is sit and stare. Maybe I missed my calling. Had I sang the song, could I have been “discovered?” Had I oozed cuteness and charm, could I have become a rising child star? We will never know. Luckily, because the whole thing was live, there is no record of this ever happening. It will never show up at that retirement party or, God forbid, my funeral where all those embarrassing things you’ve ever done somehow seem to appear out of nowhere. Nope. My five minutes of fame passed me by at four years old. But whether I appreciated it at the time or not, I was, for that five minutes, the center of attention for viewing audiences everywhere. ← Purchasing Your Graphic Design Work Online…Really? Oh those live kid shows of my youth, Uncle Gus, Rex Trailer and Ms. Jean. Then there was the terrible Big Brother. Fun memories!